The Friends of Maybury State Park spearheaded the development of the History Trail, a self-guided history tour to commemorate Maybury Sanatorium.To help combat the spread of tuberculosis, often referred to as the white plague in the early 20th century, the city of Detroit purchased eight farms in Northville that totaled of 850 acres and in 1921 opened the sanatorium. At its peak the institution was a self-contained community of more than 40 buildings and included Maybury Farm that contributed fresh milk and produce to the facility. Maybury Sanatorium gave Detroit a reputation as one of the leading cities in the world in the fight against tuberculosis before it closed in 1969. The Friends of Maybury State Park spearheaded the development of the History Trail, a self-guided history tour to commemorate Maybury Sanatorium. To help combat the spread of tuberculosis, often referred to as the “white plague” in the early 20th century, the city of Detroit purchased eight farms in Northville that totaled of 850 acres and in 1921 opened the sanatorium. At its peak the institution was a self-contained community of more than 40 buildings and included Maybury Farm that contributed fresh milk and produce to the facility. Maybury Sanatorium gave Detroit a reputation as one of the leading cities in the world in the fight against tuberculosis before it closed in 1969. The History Trail features 12 interpretive plagues, covering the various buildings and life at the sanatorium and are scattered along the park’s Paved Trail and a small portion of it’s Hiking Trail. Most people begin at the trailhead kiosk near the Hickory Picnic Shelter, where interpretive plague No. 12 is just a short walk away. To walk to all of them from Hickory Picnic Shelter would be roughly a 3-mile hike. Maybury has several picnic areas and shelters. Oak and Maple shelters along with the adjacent tot lot are reached on foot or bicycle via the paved path from the Eight Mile Road parking lots. Other picnic tables and shelters are scattered throughout the park, while on the south side of the fishing pond is a day-use camp that is rented out to groups for natural resource education programs. The Maybury Farm consists of several barns where visitors get a close, "hanging on the fence" view of chickens, pigs, cows, sheep and other typical farm animals. There is also a display of old farming equipment, but newer plows and harvesters are used to actually farm 40 acres. The farm is operated by the Northville Community Foundation (www.northvillecommunityfoundation.com). 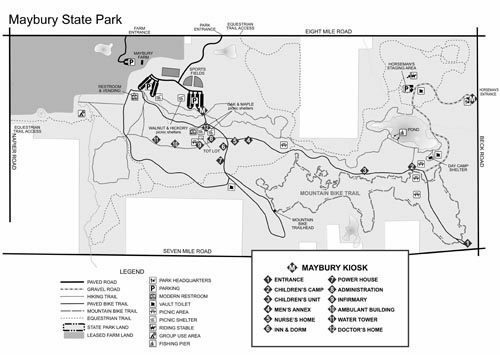 Maybury is open year round and a vehicle permit or annual state park pass is required to enter. Maybury Stables is open April thru the last weekend before Thanksgiving and in the summer the hours are Tuesday thru Sunday from 10 a.m. to 5:30 p.m. Maybury Farm opens in early April and the hours are noon to 4 p.m. daily. There is a separate per person fee for the farm. The main entrance to the park is on Eight Mile Road, 5 miles west of I-275. The park headquarters is located on an access road off Beck Road just south of Eight Mile Road.